Let's talk about twin bassinets and play yards. These are a great option for families with limited space and also for the early months. Bassinets can generally be used until babies are around 6 months, while play yards can be used into the toddler years. New on the market (as of 2017) is the Mom invented, Romp & Roost® Play Yard (shown above). This play yard is unlike anything else currently on the market. It boasts a larger size which will easily accommodate twins, but also a unique, patented divider for when they need to be separated. This is helpful with twin babies who nap/sleep together, but with the added security of a barrier. With the divider out, it allows one large playpen for one or two children to play independently or together or learn crawling and walking skills in a safe environment. Additionally, with the divider out, it can sleep one large toddler or small child with plenty of room. With the divider in, it has the ability to sleep two infant or toddler twins. Lots of possibilities for this set up and pretty reasonably priced at $218. You can order one online from Trends In Twos. HALO is a well known brand that has been around for awhile. They specialize in bassinets and sleep-sacks, so it's no surprise that they have come up with this ingenious option for families with twin babies. It's the priciest of the bunch at over $400, but man, this thing is amazing! This twin bassinet is pretty darn cool for families expecting twins. It's not only space-saving, it also rotates 360-degrees for total convenience and safety. Your duo can sleep as close to you (and each other!) as you’d like....How awesome is that? 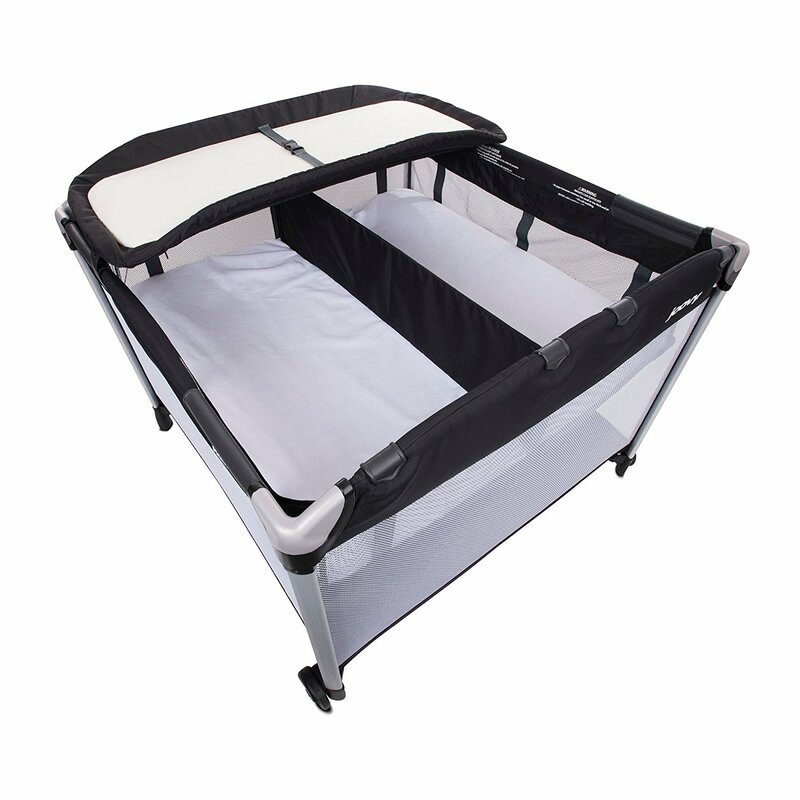 The twin bassinet keeps them safely in their own separate sleep areas, reducing the risks associated with bed-sharing. Additionally, the side walls lower with gentle pressure and automatically return to their upright position so that you can easily tend to your infant twins without getting out of bed. This handy item converts from twin bassinets to their trendy (and very popular) Pack N Play. This is a great quality item by a brand that's been trusted by parents for a very long time. Even though your twins would only be able to sleep in this for about 6 months or so, it would still be handy to use as a playpen afterwards. I know a lot of parents actually bought one of these in addition to two cribs because it was so handy. You could keep this in the living room, kitchen, or any other room that you spend a lot of time in with your twins. The JOOVY Room2 Twin Nursery Center option is actually an accessory piece that fits on top of their Room2 play-yard which is sold separately. 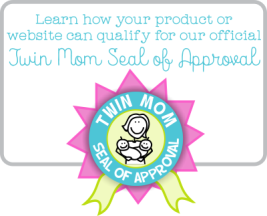 Still, this practical accessory is easy to install, and it is great for use with one baby, twins, or multiples. 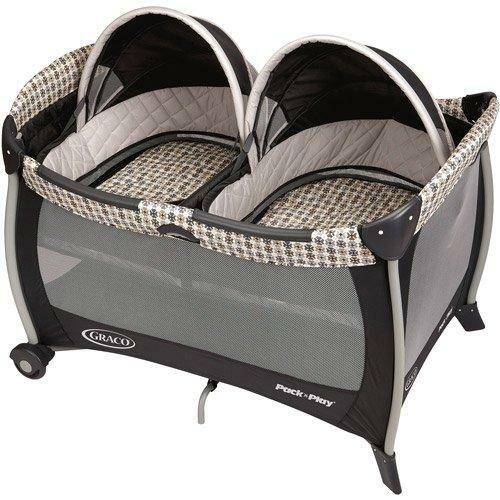 It has a bassinet area to hold twins up to 15 lbs each, or 30 lbs total. A removable center divider zips into place to give each baby a separate napping/sleeping area for babies up to about 6 months. The Room2 Twin Nursery Center also includes a changing table that supports one baby up to 25 lbs. The surface is removable and machine washable (we love that!). And when it's not in use, the changing table flips over the side of the playard to keep it out of the way. The Nursery Center piece by itself isn't to expensive (from around $60 to $80), but you do have to purchase the playard separately, which is another $120 or so, bringing the total set-up to around $200.